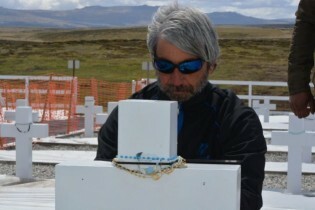 Julio Aro, a veteran of the 1982 Malvinas/Falklands war, returned to the islands in 2008. When he visited the Argentine Military Cemetery he found 121 tombs that read: "Argentine soldier only known by God", and he resolved to return their identity to his fellow soldiers. Today he can say that, to a large extent, he has achieved his goal. As Sri Lanka readies to begin the grim task of searching for thousands of war missing, those doing the tracing on the ground say that they still face intimidation and threats while doing their work. Details of a secret detention center, where serious human rights abuses took place, deep inside the sprawling Tricomalee Naval base in the east of Sri Lanka are slowly emerging. With 21 million Yemeni civilians caught in the grips of a conflict that has been escalating since March, the killing of two local aid workers Wednesday could worsen their misery, as a major humanitarian organisation considers the future of its operations in parts of the war-torn country. The charred foundations are all that is left of the homes that made up Kenemote village in the mountainous Eastern Highlands Province of Papua New Guinea in the southwest Pacific Islands. After peace talks failed earlier this month, the ongoing conflict in South Sudan between government forces and opposition forces that began at the end of 2013 is having a severe impact on the country’s food security and civilian safety. Jessi Joygeswaran seems like your typical 23-year-old young woman. She has an infectious smile and laughs a lot when she talks. Like many other young women anywhere in the world, her life is full of dreams. A cash-strapped United Nations, which is struggling to reach out to millions of Syrian refugees with food, medicine and shelter, is desperately in need of funds. Can Nepal’s TRC Finally Bring Closure to its War Survivors? The picture of Muktinath Adhikari, principal of Pandini Sanskrit Secondary School in the Lamjung district of west Nepal who was killed during the country’s decade-long civil conflict, became an iconic portrayal of the brutality of the bloody ‘People's War’. It is a hot, steamy day in Sri Lanka’s northwestern Mannar District. Mid-day temperatures are reaching 34 degrees Celsius, and the tarred road is practically melting under the sun. In four months’ time, Sri Lanka will mark the sixth anniversary of the end of its bloody civil conflict. Ever since government armed forces declared victory over the Liberation Tigers of Tamil Eelam (LTTE) on May 19, 2009, the country has savored peace after a generation of war. Jessi Jogeswaran, a 20-year-old woman from Sri Lanka’s northern Jaffna district, waited over six hours with 18 friends in the sweltering heat just to get a glimpse of Pope Francis on Jan. 14. Snow-capped mountains may become a thing of the past in Peru, which has 70 percent of the world’s tropical glaciers. And farmers in these ecosystems are having a hard time adapting to the higher temperatures, while the governments of 195 countries are wrapping up the climate change talks in Lima without addressing this situation facing the host country. When a stray bullet fired by Taliban militants became lodged in her spine last August, 22-year-old Shakira Bibi gave up all hopes of ever leading a normal life. Rising out of a thick forest about 17 km from the nearest main road, the Madhu Church is a symbol of spiritual harmony and tranquility. When the wind blows you hear the leaves rustle. Other times a solemn silence hangs in the air. Old-timers say that once, almost an entire generation ago, the grass grew six feet high in the church compound, and elephants wandered through it. The clock marks 9 AM when a bus coming from the Mexican city of Tapachula reaches Corinto, on the border between Honduras and Guatemala. It is the first bus of the day, carrying children and their families sent back from a failed attempt at making it across the border into the United States. People are willing to wait a long time for a few minutes in the hands of Aloysius Patrickeil, a 32-year-old barber who is part-owner of a small shop close to the northern town of Kilinochchi, 320 km from Sri Lanka’s capital, Colombo. The village of Valipunam, 322 km north of Sri Lanka’s capital Colombo, occupies one of the remotest corners of the country’s former war zone. The dirt roads are impossible to navigate, there are no street lights, telephone connections are patchy and the nearest police post is miles away, closer to the centre of the battle-scarred Mullaitivu district. In a country suffering from what the U.N. has called “ethno-religious cleansing”, a “disappeared” state structure and “unacceptable sectarian brutality,” gaining access to the population of the Central African Republic has proven a difficult and sometimes deadly task for humanitarian workers.